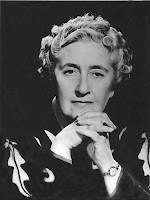 Yesterday (NZT), the Daily Mail (online) published for the first time ever, the first part of a recently-discovered "lost masterpiece" from the doyen of mystery fiction, Dame Agatha Christie. AGATHA CHRISTIE'S SECRET NOTEBOOKS is touted as a "fascinating exploration of the contents of Agatha Christie's 73 recently discovered notebooks, including illustrations, deleted extracts, and two unpublished Poirot stories... Buried in this treasure trove, all in her unmistakable handwriting, are revelations about her famous books that will fascinate anyone who has ever read or watched an Agatha Christie story. What is the 'deleted scene' in her first book, THE MYSTERIOUS AFFAIR AT STYLES? How did the infamous twist in THE MURDER OF ROGER ACKROYD really come about? Which very famous Poirot novel started life as an adventure for Miss Marple? Which books were designed to have completely different endings, and what were they? Full of details she was too modest to reveal in her own Autobiography, this remarkable new book includes a wealth of extracts and pages reproduced directly from the notebooks and her letters, plus for the first time two newly discovered complete Hercule Poirot short stories never before published." The Daily Mail is serialising one of those previously undiscovered Poirot stories, THE CAPTURE OF CEREBUS (note -there was a different Poirot short story published under that same name in 1947). It is apparently quite unusual for Christie, in that it contained some faily blatant political comment, including a character that was a clear reference to Adolf Hitler (perhaps the reason for it not being published at the time). What do you think of this news? Was Christie the author that originally got you interested in crime fiction? Are you a fan? What do you think of the first part of the "new" Poirot story? Does the upcoming "behind the scenes" book interest you? All comments welcome. My first exposure to crime fiction was Sir Arthur Conan Doyle and then Edgar Allan Poe. However I never really got interested in mysteries until I happened to watch a PBS Mystery Theatre Production of one of PD James' Mysteries. I wish it had been a Miss Marple story that had been discovered. I consider her a more interesting character than Poirot and the Miss Marple plots are far more interesting and complex than the Poirot ones. You mentioned that a Poirot story had started out originally as a Miss Marple story. I suspect she changed it because it wasn't complex enough to be a Miss Marple mystery. In the Miss Marple mysteries, the focus is strongly on the plot while in the Poirot stories, the focus is on Poirot himself. Yes - I am actually more interested in some of the things in the notebooks, about her plotting etc (considering she was so prolific with coming up with plots - a book a year for 60,70 years + short stories), than the two new stories. Personally, I always preferred Poirot to Marple, but then again I was introduced to Christie at 11,12 years old, so maybe the eccentric character was more interesting to me then - I haven't read enough of Marple to comment on whether those plots are "more complex". I think 'admirer rather than fanatic' would be where I would place myself as well - I have a sense of pleasant nostalgia with Christie, since I started reading her as an adolescent/pre-teen... and it was part of my introduction to more 'adult' crime fiction, rather than just kids/young adult stuff (along with THE HOBBIT and THE LORD OF THE RINGS). My first encounter with Miss Marple was very negative. I hadn't the slightest idea of who she was at that time. It was an old film on TV and there was this silly woman running around solving a murder and it was obviously being played for laughs. Years later, I was watching a PBS Mystery Theatre presentation and something seemed familiar about it. The detective was Miss Marple, as played by Joan Hickman. After some research I concluded that I had seen a version with Margaret Rutherford as Miss Marple. It is a good example of what the actors and directors can do to a very good story.